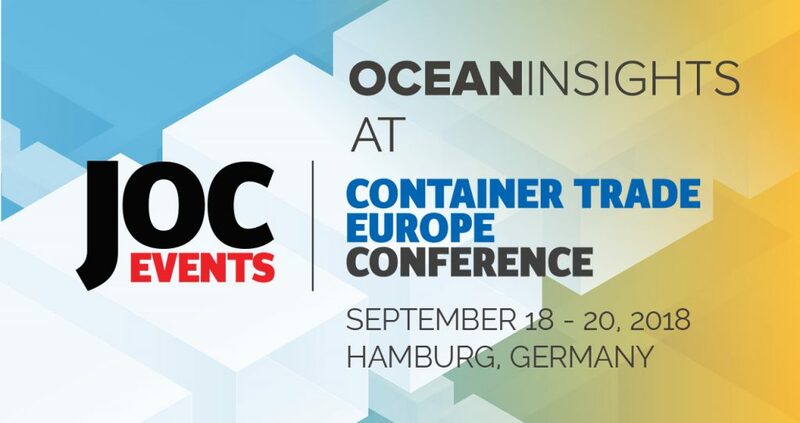 With containerized freight transportation our bread-and-butter business at Ocean Insights we’re delighted to be co-sponsoring the 2018 JOC Container Trade Europe Conference in Hamburg from September 18-20. “With this conference taking place on our doorstep in Hamburg, it will afford Ocean Insights the opportunity to network with industry leaders and build upon our reputation as a world-class software provider,” says Josh Brazil, our Chief Operations Officer. It could hardly be more convenient. The conference venue, Sofitel Hamburg, is only a couple of hundred meters from our Hamburg office. But that, of course, isn’t the real reason why we’re co-sponsoring this event. The objective of the conference is to “deliver answers for users of container shipping services … by analyzing major trends in intercontinental container shipping supply, demand and capacity, and exploring and illustrating strategic and innovative opportunities to improve transit times and reliability, and reduce costs.” And that perfectly fits in with our mission as an innovative force in container tracking to bring a previously unattainable level of transparency into container shipping operations. This allows our customers to plan and monitor their operations on a level never experienced before.